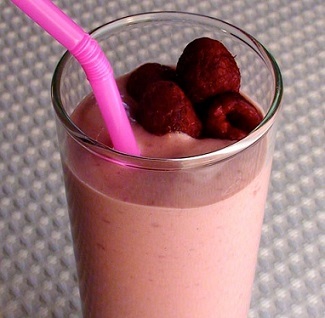 Smoothies are very popular, and for good reason. This Smoothie Recipe is my personal favorite and one that sells well at breakfast time at the restaurant. I've told him many times that fermented grapes do not count, so he drinks his fruit every day. 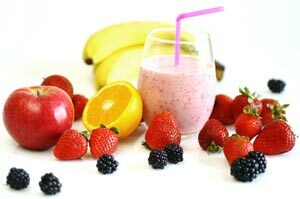 A smoothie is a blended beverage made from fruits and juices. Sometimes other flavors such as chocolate are added. To me, a smoothie is like a milkshake but often they are non-dairy drinks. This particular recipe does have a little low-fat milk (or you can use yogurt) in it, but you could leave the dairy out if you prefer. I read where the man who started the "Smoothie King" company, Stephen Kuhnau, claims he created the original smoothie in the 1960's. He may have coined the term "smoothie," but whether he invented the beverage or not is in dispute. "Orange Julius" has been around since the 1920's. Creating smoothies is actually pretty fun. Start with a "base" flavor or flavors and then add one flavor at a time, tasting as you go. Stop when you are pleased with the overall taste. For this drink recipe, I started with fresh organic oranges and apples and juiced them with my Solo-Star juicer. 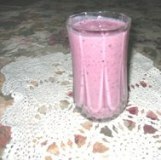 Then I blended that combination of juices with the rest of the fruits in the recipe and a little low-fat milk. When I make a smoothie, I usually try for five different (but compatible) fruits. 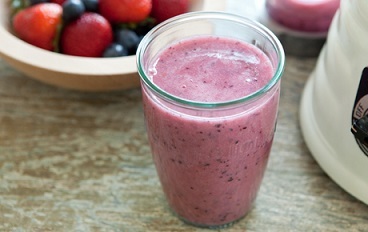 Try this six fruit smoothie recipe. I know you'll like it, but don't be afraid to invent your own. Have some fun! I always keep frozen fruits on hand in case I run out of fresh product. You might want to keep some mixed berries in your freezer as there are usually at least four fruits in each of those bags. Preparation time: 25 minutes to juice 2 quarts of juice and clean up. 5 minutes to blend the smoothie. Serves 2. Tip: I only juice enough fruit to equal about 1 quart at a time (usually six medium oranges and two medium apples) because nutrients are lost after a few days. How much you juice depends on how much you believe you will use in 2-3 days. Enjoy your smoothie recipe (you're feeling healthier already, right?) and the company of those you share it with! "Every good tree produces fine fruit, but every rotten tree produces worthless fruit."